Heat oven to 400°F. Grease or spray cookie sheet, or line with cooking parchment paper. Unroll pizza crust dough on cookie sheet. Bake 10 to 15 minutes or until crust is golden brown. Set aside to cool. In large bowl, beat whipping cream and lemon peel until stiff peaks form. Gently fold in chopped meringue cookies with spatula. To assemble flatbread, spread preserves over cooled pizza crust. Next, spread whipped cream mixture over preserves. 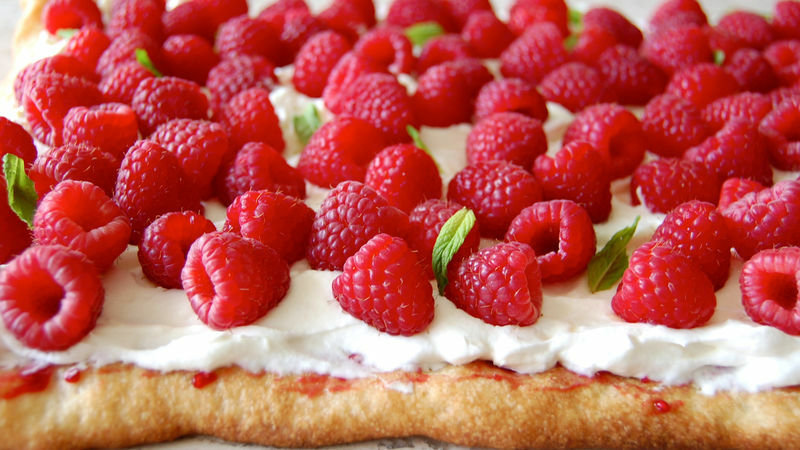 Top with fresh raspberries, and garnish with mint. You can keep this flatbread in the refrigerator up to 3 hours before serving. Raspberries not in season? Substitute with any of your favorite fruits. If using a juicy fruit, add it to the flatbread just before serving it.